Hooray! 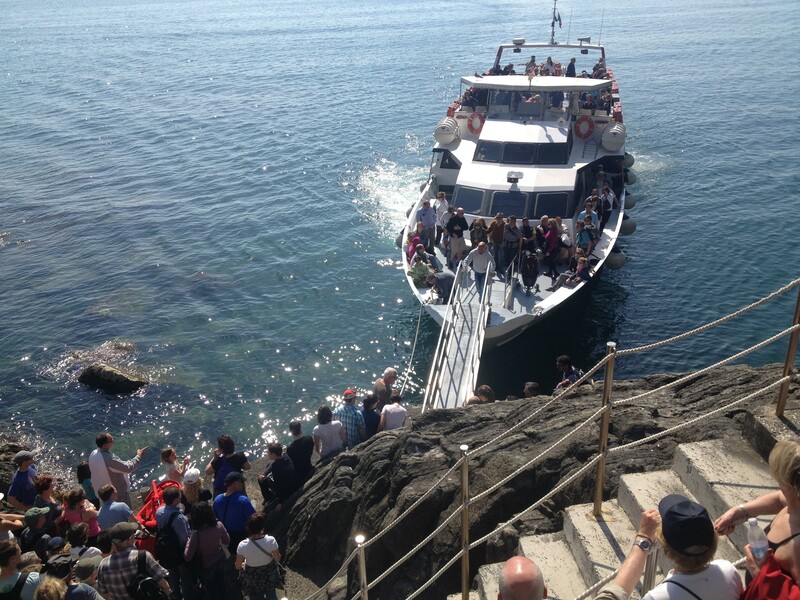 Spring is in the air and the ferries connecting the Cinque Terre villages are back in business starting Saturday, March 28th. 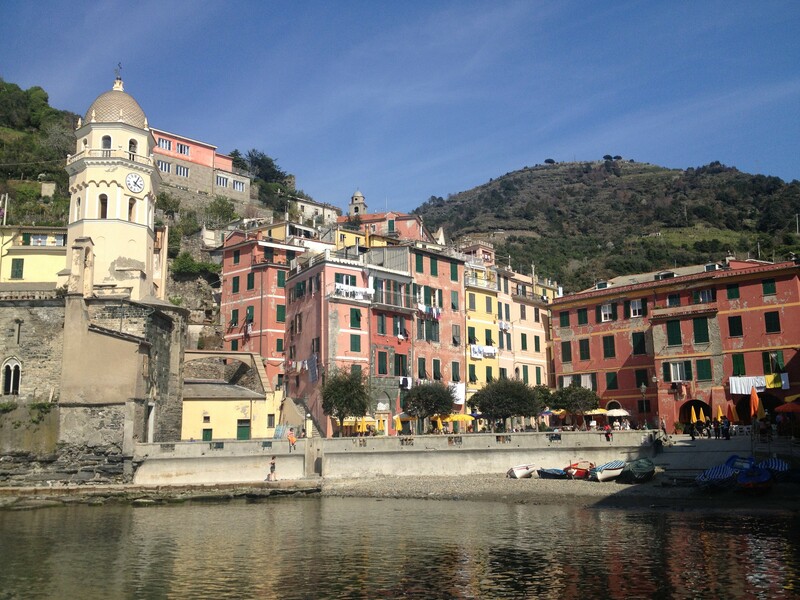 The ferries are a great way to see the Cinque Terre from a different perspective. Below you’ll find the schedule that is valid from March 28th until April 17th, 2015 (they change the schedules frequently throughout the peak-season so I’ll post new schedules as soon as they are released). As you might have noticed on the schedule, the ferries also run to Portovenere (which is about a 30 minute boat ride down the coast from Riomaggiore). If time permits, I highly recommend going there. It’s one of my favorite places and the views along the way are glorious! 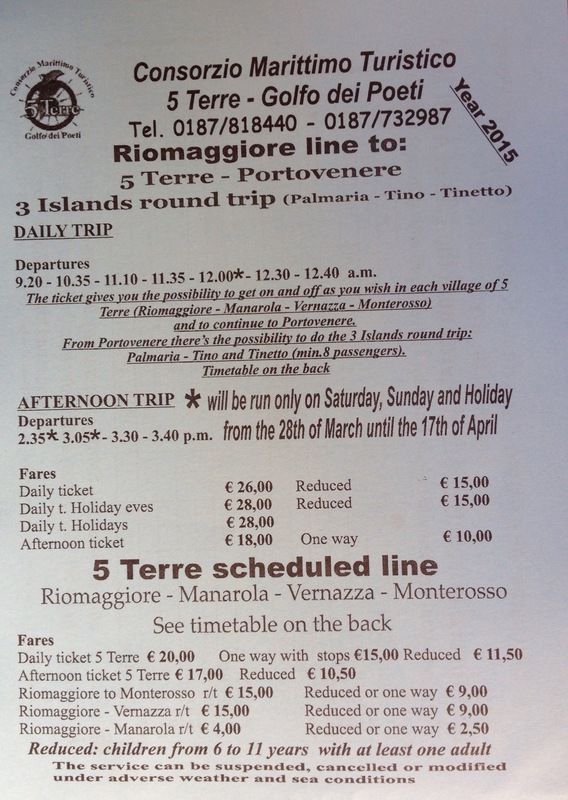 The fares listed below 5 Terre scheduled line are the ones that you’ll want to look at for the boats between the Cinque Terre. If you are wanting to travel between the Cinque Terre villages as well as Portovenere and possibly even the islands off of Portovenere (Palmaria, Tino & Tinetto) you’ll want to look at the rates above 5 Terre scheduled line. Daily ticket 5 Terre: The pass you’ll want if you’re planning to hop on and off the boats as much as you like (heading in both directions). One way with stops: This allows you to hop on and off the boat in each village (minus Corniglia, don’t forget that there won’t be a stop there as the village is located up off the sea) so long as you are heading in the same direction. For example, you can start in Riomaggiore, get off and back on in Manarola, ditto for Vernazza and then you end your tour in Monterosso. You wouldn’t be able to zig-zag back and forth between the villages (you’d need the Daily ticket 5 Terre for that). r/t: This is simply an abbreviation for round-trip. Reduced: A reduced price ticket for children 6-11 years in age (read: kids 5 and under travel for free!). Daily t. Holidays: Sunday is a considered a holiday in Italy so this will be the ticket sold for Sundays and national holidays. Daily t. Holiday eves: Bear with me, this is Italian translating at its best. What they really mean is a ticket for Saturdays and any day prior to a national holiday. Hello. I’ve been combing through your blog for a week or two. But I don’t find where to ask a question to be very clear, so I’ll just put it here. My cousin and I will be in CT between Oct 28-31. I’m interested in hiking, of course, but also wondering about the ferries. You recently published a new ferry schedule for some time ending in early October (can’t see it at the moment but I think it’s up through October 4th). But,I’m wondering if, typically, ferries run along the CT and down to Porto Venere to later dates, such as ours. Thanks for following the blog! 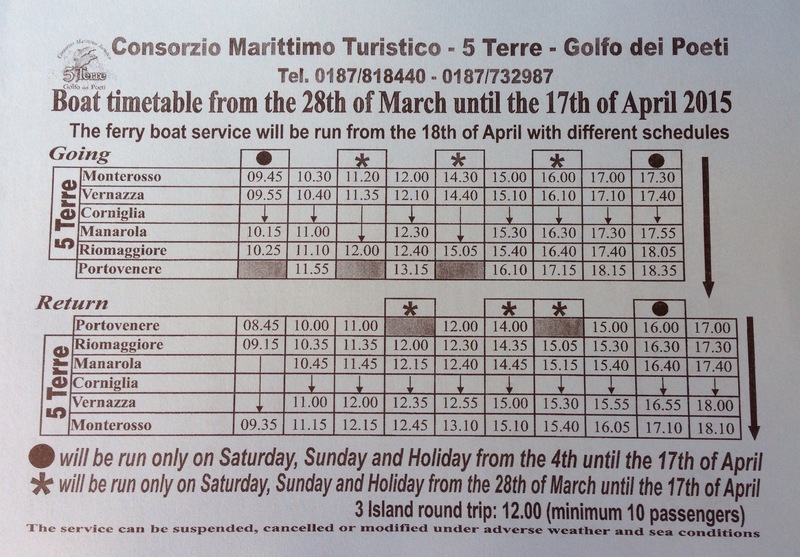 Unfortunately, the Consorzio Marittimo Turistico 5 Terre (that runs the Cinque Terre ferries) is lagging at the moment in releasing the current schedule (either by print or online). Believe it or not, I don’t even have a schedule to provide for my guests at the moment! But, I can tell you that the ferries are scheduled to run up until November 1st or 2nd (as November 1st is a national holiday in Italy). After that they will stop until next year. However, keep in mind that the schedules will be much more limited than the normal, summer ones and that weather and sea conditions will determine if the ferries will be running (for example, today we have rough seas so they aren’t running). 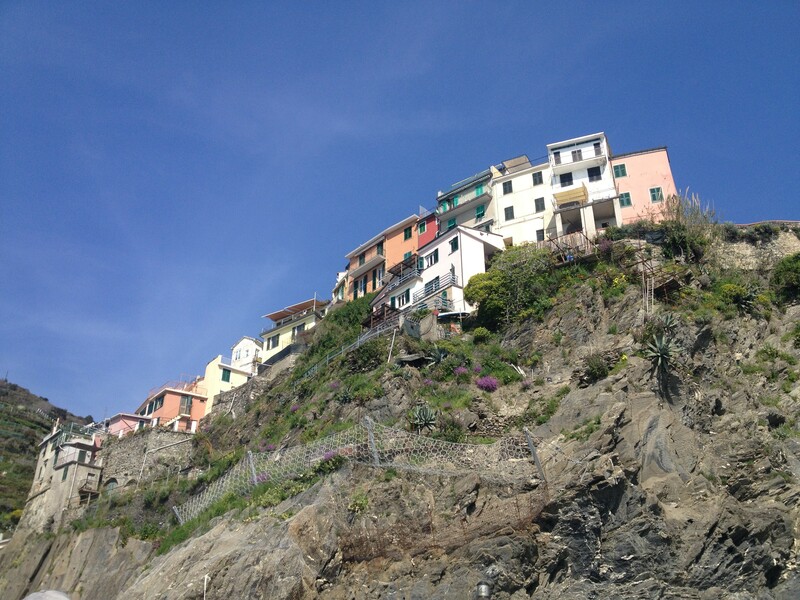 Enjoy your time here in Cinque Terre!